Day 3: Wind not Weapons: great actions inside and out! Later in the afternoon, a group of activists managed to get inside the ExCeL Centre! 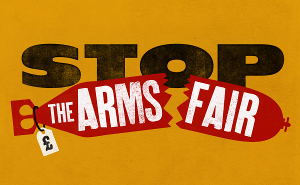 They unfurled a Stop the Arms Fair banner in front of a green howitzer that has been supplied to the Saudi Arabian National Guard, Indonesia, Thailand, and used in Mali, Lebanon and Afghanistan. This howitzer has been supplied to the Saudi Arabian National Guard, Indonesia, Thailand, and used in Mali, Lebanon and Afghanistan. The ongoing harrowing refugee crisis is fuelled by conflict, which in turn is powered in part by the global arms trade. The UK has supplied weapons being used in many areas from which people are now fleeing– including Yemen and Libya. So in the week that London will once again host the world’s largest arms fair, isn’t it time the UK recognised the link between arms sales and the terrible tragedy we are seeing unfolding around us? Wednesday’s protests highlighted the link between military spending and climate change. While 130 civil servants work assiduously in the Business Department to promote arms exports, only 1 is employed to do the same for offshore wind. The UK government spends 25 time more on weapons research than on research into renewable energy. But real security involves tackling the causes of problems, not creating more, and climate change is one of the biggest that we face. CAAT’s research shows that the renewable energy sector has a similar breakdown of skill levels and employs many of the same branches of engineering as arms. Rather than chasing extreme energy extraction methods like fracking, the government needs to shift its priorities to renewables. The UK has the largest wind resources in Europe and already have as much capacity installed as the rest of the world combined. #WelfareNotWarfare. Head down to the ExCeL Centre for an academic conference on the militarisation of education and actions highlighting the need to shift priorities from military spending. Can we not ask our MP’s exactly what the end product of the weapons industry is? Weapons are designed to destroy and kill on an industrial scale. The cannot be used for defense as a bullet cannot hit an incoming bullet. A person who deliberately kills on the suspicion that another MIGHT kill is a murderer. At present our MP’s are murderers with malice aforethought and I personally do not mandate this.